It's that time of year when things are starting over and the same goes for restocking stuff around the house. The first on my list this year was my first aid kit. I mentioned on my facebook page that I had done this and someone asked me what I include in my kids. Here is a list that you can print and keep in your kit to make sure it stays fully stocked. This is a basic list and you can add anything else you feel is necessary. With 3 boys, I have to know where this kit is at all times. In the past it has been in a high cabinet. Now it is in a place that my children can get to if they need it. Bottles such as this hydrogen peroxide, spray on solar cane for burns or calamine lotion all go in my medicine cabinet in the downstairs restroom. Two kits are hung in our pantry doors and a copy of instruction that came with our kids on how to treat injuries and basic first aid instructions. Proudly, I renewed my Red Cross CPR and First Aid Certification last January. I encourage all moms and dads to find a class and take it. It's only a few hours out of your life but having the knowledge could save a life. Hmm, would you believe with two kids we don't have one! Just some band aids & dettol! Must get on to this I think! 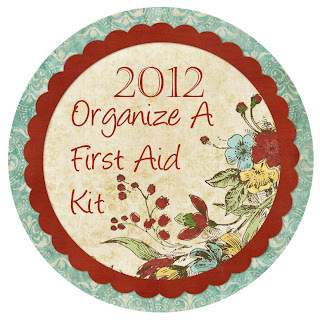 LOL, I wish our first aid needs would fit in a box! 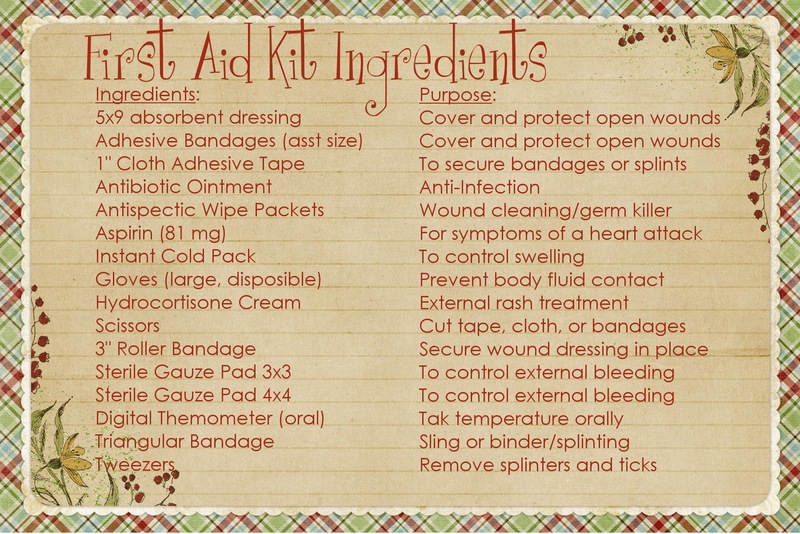 I have a whole cabinet to treat the weekly bites, bruises, rashes, and scrapes of my 4 kids. Plus, my hubby has a complicated relationship with my pairing knife.